Green pool, full of algae, but no phosphates?! You are here: Home / Blog / Green pool, full of algae, but no phosphates?! Have you ever had a pool with algae, but no phosphates? Uncovering a green pool is not unusual. But it may seem unusual to test for phosphates and get a reading near zero. It is not uncommon for pool owners to remove their mesh pool cover and find their water green, full of algae, and just...well, gross. It would stand to reason that phosphate levels must be high in the water, if all that algae has grown in there during the winter months. 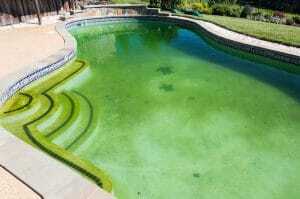 But actually, phosphate levels, when tested, usually appear to be really low in a green, algae-filled pool. Especially one that has been stagnant for months. So you can have algae, but no phosphates. Why? A pool owner calls their pool service company after lifting their pool cover off to find green, nasty water. Before getting the filtration system up and running, vacuuming and trying to clean the pool out, the service tech remembers to test for phosphates. Orthophosphates are consumed and held within algae's cell walls. But the phosphate test readings are virtually zero. That cannot be right...so the operator tests for phosphates again with another water sample. After all, how could the pool have algae, but no phosphates? Test results: zero again. How is this possible? When the pool is full of algae blooms, phosphates can be really low--close to zero--because the phosphates have been consumed by the algae itself. Specifically, orthophosphates are held within the cell walls of algae, so it is no longer free-floating, and therefore, untestable. It doesn't mean there are no phosphates getting into your pool, because obviously there are if you have so much algae. 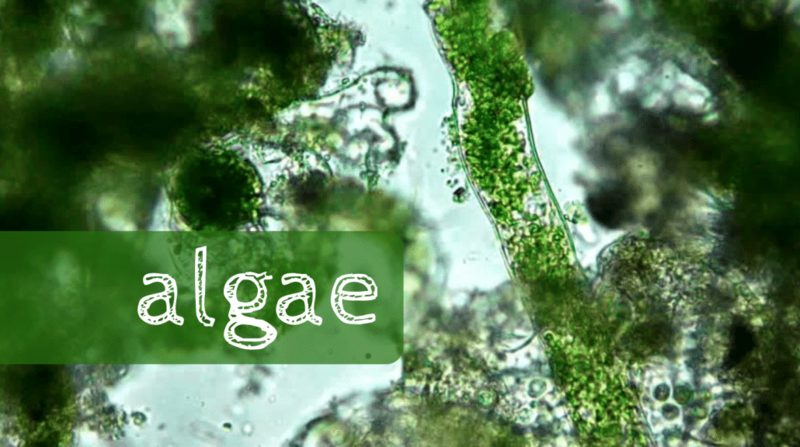 So while it may look like you have algae, but no phosphates, that's not actually the case. Don't be fooled by a natural algaecide failing to clean up the problem either...it may be too early to use such products. If you're testing for phosphates in any pool—green or clean—you should be aware of several factors that can affect your results. First, understand that most test kits only check for orthophosphates. But orthophosphates are not the only type of phosphates found in pools.  Monophosphorus and Polyphosphorus, for example, are not reactive to common tests in the aquatic industry, so they’re invisible to operators. That being said, in the presence of an oxidizer and/or direct sunlight, mono- and polyphosphorus will break down into orthophosphate over time. We should repeat that. Your phosphorus levels may be higher than what your test kit says, because mono- and polyphosphorus do not show up. But they still matter! Because oxidizers (like chlorine) and/or sunlight (every outdoor pool) will break them down into orthophosphate over time. Because of this, you can actually see an increase in phosphate levels after putting in a phosphate treatment product, depending on the circumstances. 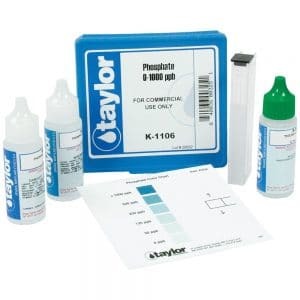 Orthophosphate test kit from Taylor. It only goes up to 1000 ppb. What if you're off the chart? Second, test kits have their limits. For example, many tests go up to 1000 parts-per-billion (ppb) for orthophosphate. The water turns blue…and the bluer it gets, the more orthophosphates you have. Well what if your test vial's water is darker blue than the highest 1000 ppb color? Believe it or not, this happens often, and when it does, you have no way of knowing how high your phosphate levels actually are. What if it’s 5000 ppb, or 10,000? Regardless of the severity of your phosphate level, it remains unknown. Note: there is a way to test for higher phosphates, but it involves math and pure bottled water. Expand the water sample by diluting the pool water, in an attempt to get your sample color within the color scale on the test kit. Take pure bottled water, and mix with the pool water at a 10:1 ratio (10 parts bottled water, 1 part pool water). Test that sample, and whatever it reads, multiply the result by 10. Third, before you assume that having algae, but no phosphates is an error, that may not be accurate. 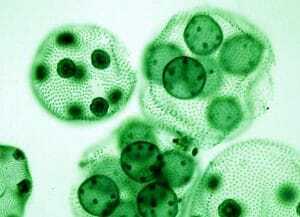 Remember that algae is containing the orthophosphate within its cell walls. Removing phosphates from the pool does not kill algae, and therefore cannot remove the phosphates hidden within its cells. That means that killing algae could raise your phosphate levels, as the orthophosphate is freed from its prison (algae cells). Many algaecides are copper-based, which can complicate your pool even more if they fall out of solution. Fourth, to get an accurate phosphate reading, the pool needs to be clean and clear. Many products force pool operators to contradict their own strategy; specifically in regards to metal staining and scale buildup vs. phosphate control. It's like you have to make a choice...do you control metals and scale at the expense of higher phosphates? Or control phosphates at the expense of metal stains and carbonate scale buildup? Why is it either/or, and not both? Because usually they are conflicting treatments. And conflicting products lead to more headache for operators; or even worse, more unexplained management issues. There's not much worse for a pool operator than a problem that defies logic (kind of like having algae, but no phosphates). See, here's the thing. Most metal-sequestering products are phosphate-based. Obviously, that raises phosphates. It's vice-versa for most phosphate reducers. So the two products conflict, leaving pool owners and operators spinning in a hamster wheel of frustration. Oh, and a lot of wasted time, effort and money. The ideal solution is to be able to control phosphates AND metals and scale, without the conflict.